Justin Says: A classic example of how a little repetition quickly rolls downhill from chuckle to hilarious and then finally bottoms out at annoying depending on your tolerance. 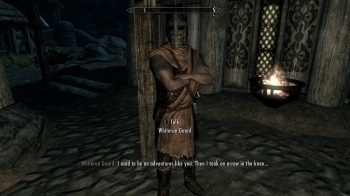 The phrase "I used to be an adventurer like you, but then I took an arrow in the knee," was certainly not the first of it's kind, but for the briefest moment is was one of the funniest things in gaming, until over-saturation finally did it in. Skyrim also had its fair share of other unintentionally hilarious moments. Whether it's the mighty dragonborn prancing around the fields collecting flowers and butterflies while a dragon attacks a nearby town or boxing with a bear to get your armor skill up, while scarfing hundreds of potatoes to regen health, Skyrim has it's laughable moments when looked at in context. Paul Says: I sunk so many damn quarters into this arcade shooter in my younger days, because this game was not only fun, but just plain silly to boot. 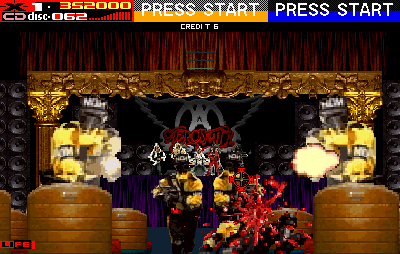 Set in the far off dystopian future of 1996, the "New Order Nation" has taken control of the world and banished all music, tv and video games, and has even gone so far as to hold the rock band Aerosmith hostage. It falls to you and your stockpile of explosive CDs to save the day and bring NON down. Are you a bad enough dude to gun your way through countless yellow and black uniformed mooks, ninjas, and spear-throwing Amazonian natives (I wish I was joking) to save the members of America's greatest musical treasure?! And if you need extra incentive, you'll get to hear a nifty digitized versions of some of Aerosmith's best hits, like "Eat the Rich" and "Sweet Emotion" on loop throughout the whole game! Remember, music is the weapon!